A new (and old) game was released for the Switch recently. 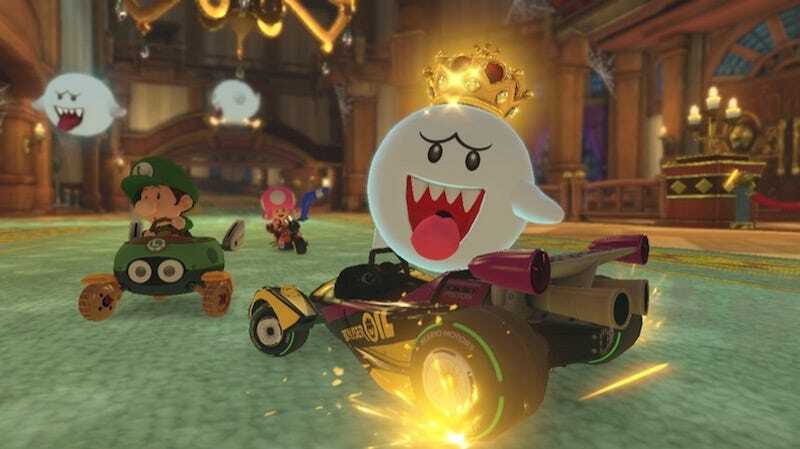 Mario Kart 8 Deluxe came out on April 28th as the first widely appealing multiplayer game for the console. This is the Switch’s first big test in declaring itself as a device for communal gaming. Back when Nintendo released the first video of the Switch there were various scenes of Millennials gathering to play games either at home or at remote locations. Nintendo is obviously striving to retain the image that their consoles are great for getting people together and playing. But there’s a problem: the Switch currently isn’t a party console for most people. What’s keeping it from being one? The higher price point. To reach the full potential for multiplayer, the cheapest route to go is to buy another set of Joy-Cons, making your total for a 4 player experience $80 (on top of what you spent for the console itself, of course). And what’s the quality of this 4 player experience with two sets of Joy-Cons? A majority of the reviews for the Switch suggested that buyers also purchase the pro-controller because the Joy-Con grip was too cramped. Now, divide that Joy-Con grip in half—that’s what you’re playing with. I have very large hands, so it seems ridiculous to hold something so small. But others have complained about the miniature size of using a single Joy-Con. It allegedly doesn’t make for a comfortable experience. Warning: the hands in this photo are larger than normal... but still, come on! So, those pro-controllers should easily fix that, right? How much do those cost? Seventy bucks. Let’s say the owner of the system gets used to the Joy-Con grip, so to get a 4 player local party they only need 3 extra controllers. That’s $210, more than two-thirds the cost of the system itself. Buying a system is a tough choice for a gamer working with a budget (and I think most are), so asking them to go $210 out of their way for a comfortable multiplayer experience is a high price. A good portion of these players are going to opt to utilize multiplayer setups they already have (especially if they already own the ported multiplayer game). At one point I thought, Why is it so different now? The controllers for the Wii U weren’t exactly cheap. But I got by without any complaints. The key difference was backwards compatibility. Those Wii-motes I had for Mario Kart Wii worked just fine. I saved myself $100 with those two controllers (I would’ve bought 2 pro-controllers to make up for this, priced at $50 each at the time). But I couldn’t use Wii-motes to play Smash! That would be absurd. Which is where an essential piece of hardware that made Sm4sh a success came in: the Gamecube adapter. It was extremely difficult to get ahold of at the time, but it only ran me $20 to add 4 controllers that I already had. Let’s compare that to the pro-controller alternative. That would’ve been $200, a $180 difference. That’s very close to what they’re asking for a comfortable multiplayer Switch experience, but there aren’t any options now. I don’t need to get into how expensive this would be, do I? Some readers are probably saying, “What’s all this noise about local multiplayer? All of my friends own a Switch. They can bring their own console if they want to play or we can play online.” Well, all my friends don’t have one. When it came to the Wii U, I had to lug that thing around everywhere for parties because no one wanted to buy one. Nintendo is still trying to recover from that image. Many people are uncertain if they want to buy a Switch. So far it has sold out because there’s only been enough to supply the core Nintendo fan base. At some point that consumer base will be taken care of. Nintendo wants to win over the people who are on the fence. Going over to a friend’s place and playing is the best way to get someone to commit to buying one. But, for now, there’s no point in going over to a friend’s place if they don’t want to shell out the hundreds of dollars in cash needed for a decent multiplayer experience. Again, Nintendo is shooting themselves in the foot. As the year goes along there will probably be third party controllers released. This is essential for the success of the Switch. But Nintendo also needs to figure out how they can offer alternatives to fans (as they’ve done with backwards compatibility and things like the Gamecube adapter). Until then, all multiplayer games are going to be severely hampered. And I can’t even get excited about a purported Smash game for the Switch, not with that kind of price tag attached.